The best depth finders can not only help you find where the fish are but can also tell you how far down under the surface you need to go to get them. We sacrificed our time and spent a lot of time fishing to research some of the best brands and top selling fishing depths finders. The result? Our fish depth finder reviews. Before we get started, let’s look at some key features to know before you start shopping. Display Size: The screen size varies with these tools. Some are so small that you can even wear them around your neck. Others will have to be mounted. Generally, the larger the screen, the easier you can see it. Max Depth: These max depths on these machines range from 200 to 1500 feet. Where you fish determines what you need. If you keep to lakes or rivers, you don’t need that same max depth as someone who’s ocean fishing. Transmit Power: This is the strength of the “ping” and it’s measured in RMS. So, what does that mean? The higher the power, the stronger the signal is that’s sent into the water to figure out depth and find fish. Alarms: Alarms aren’t necessary but they do make your fish and depth finder more useful. You don’t have to stare at the screen, just wait for the right alarm and you’ll be alerted to what’s going on. Color Display: You can certainly have a great fishing trip without one, but a color display makes it so much easier to determine what’s actually happening on the screen. You can distinguish between different things more easily when they’re in color. Warranty: Think about it: these items are going to be used outside, in the sun, in bad weather at times, around water. A good warranty is important because, to put it bluntly, there’s a lot that can go wrong. All right, we’ve covered some of the most important things you need to know about fishing and depth finders. That means it’s time to dive into our reviews. If you’re running short on time, the best place to start is with our top and budgets picks, the first 2 items on our list. Stick around if you can, the products that round out our top 10 are all pretty great. All right, let’s get right to it! If you’re looking for the best depth finder for kayaks, canoes, or even ice fishing, the Garmin Striker Fish Finder is it. Thanks to its Clearvu scanning technology, you can really see more of what’s in the water and get a detailed representation of what is it. We really liked how easy this one was to use. The map is easy to read and helps you navigate around brush, docks, and other obstacles. This one is also equipped with CHIRP sonar. Basically, CHIRP sends a continuous sweep of frequencies to provide you with more data. What’s the result? Crisper fish arches on the screen and a clearer image of where they are on the map. And get this: you can even check your speed right on the screen. For a portable depth finder that won’t break the bank, check out our budget pick. 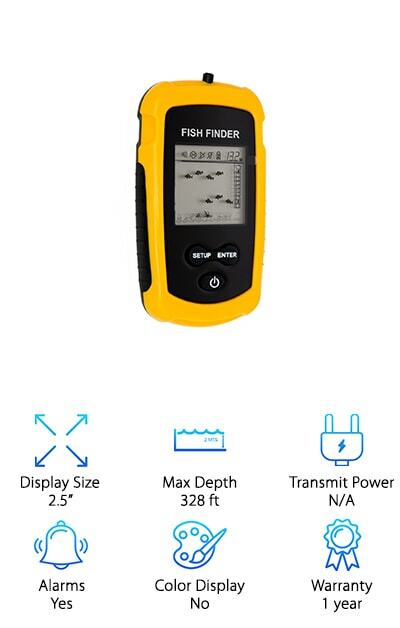 This portable fish finder from Venterior not only gives you the depth of the water, but also approximate locations of fish, weeds, sand, and rocks. 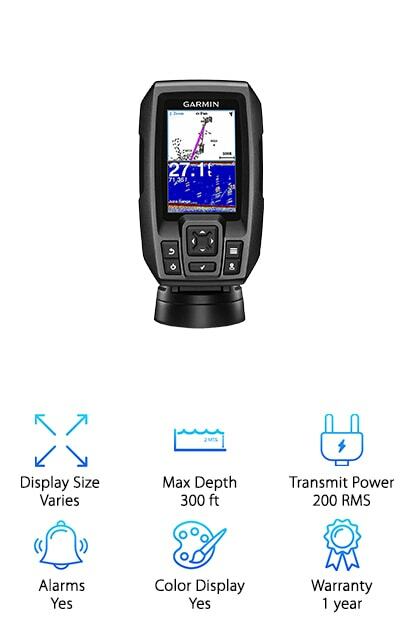 This depth finder comes with 25 feet of cable and a simple float so you can use when ice fishing, floating, on a pole, or even fixed to the bottom of a small boat. Just make sure you get the sonar sensor in the water with the float. Another thing we really liked about this one is that it comes with a neck strap. No need to mount it or anything like that, you can just keep it around your neck. That way, it’s always within reach. This fish finder depth finder from Lowrance is great. For starters, we really liked the detail of the screen. Specifically, because it was really easy to see from any angle, even in harsh light. The advanced signal processing feature makes this machine really easy to use. Why? Because you don’t have to make manual adjustments and you’ll be able to see fish, debris, structures, and plants in the water more clearly. The depth finder transducer comes with a built-in water temperature sensor and can track from the bottom up at speeds as fast as 75 mph. You can monitor for fish even when you’re on the go. And here’s something we really loved. Rather than arches, Fish ID actually shows you little fish icons so you can easily distinguish them from everything else in view. This Humminbird gps depth finder is pretty impressive, which isn’t a surprise. The brand pioneered the idea of a depth finder with side imaging. The LCD screen itself is big, bright, and clear. There are 2 display modes that allow you to make adjustments to conditions when things change quickly. What kind of things can you account for? Water depth, temperature, even turbulence. This is a sophisticated piece of technology that saves you a lot of time hunting down fish. Basically, you tell it what you want and it tries to find it for you. And get this. The GPS is based on the latest data from LakeMaster. You get specific information you need to know to navigate, all based on the latest information about more than 10,000 lakes in their database. The HawkEye DepthTrax is a simple but highly effective depth finder. For starters, it’s a combination transom mount and glue-in-hull transducer. Mount it in whatever way works best for you. They even include black and white face plates and trim so you can choose the color that best suits your needs. 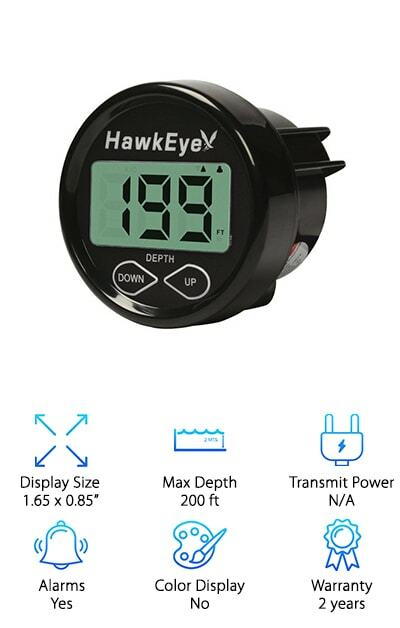 This is a precise tool that will give you readings from 2.5 to 200 feet, even when traveling at speeds as fast as 63 mph. There’s an automatic 3-stage depth alarm warning system but what we really liked it that you can program your own shallow and deep-water alarms. There’s also a keel offset feature that lets you adjust for the effects your vessel is having on the surrounding waters. One more thing: it comes with a 2-year warranty. 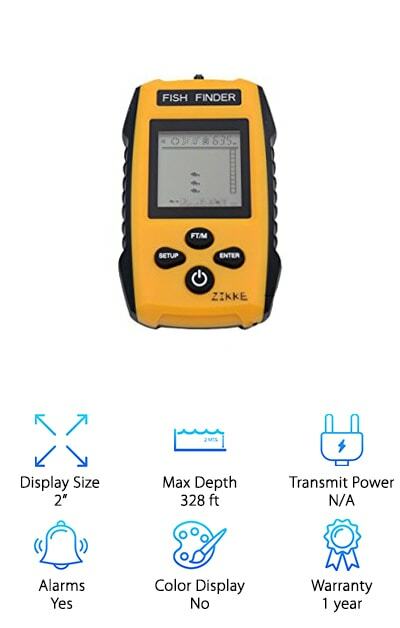 This fish finder and depth finder from Zikke has a lot of great features, but we have to say that the one we liked best was something so simple. It saves your settings even when you turn it off! It’s so nice to not have to worry about finding your way back to a hotspot! Of course, there are other great features, too. It measures depth up to 328 feet and it will alert you to a bunch of other things, too: fish, weeds, sand, and debris on the lake floor. Because it uses sonar, this one can find even fish in dirty water, where the silt or mud has been stirred up. One more thing, there are some different levels you can choose from, like battery saver mode, backlight mode, and fish display. 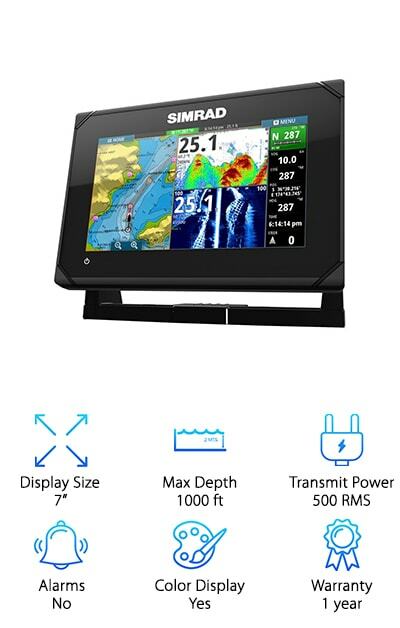 If you want the best gps depth finder that does just about everything, then the Simrad GO7 XSE Fishfinder is for you. First off, we love that it’s a touchscreen and it works just like a smartphone: tap to select, pinch to zoom, drag to scan. You can even pick different wallpapers! It also comes loaded with a lot of different mapping programs, too. And it doesn’t stop there. 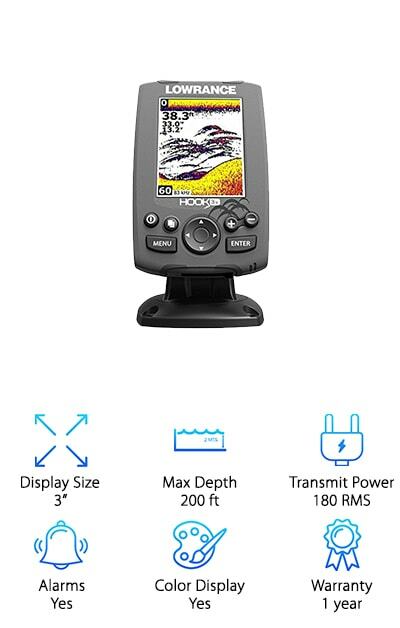 The TotalScan transducer does medium and high CHIRP sonar and StructureScan HD imaging so you can see just about everything under the water, from fish to sandbanks to rocks. You can even store places you’ve been so you can always find your way back to a spot you found to be lucky. Oh, and one more thing: it also comes with WiFi and Bluetooth. It might be small, but this depth finder from Venterior is mighty. It comes with a round transducer with a 25-foot cable and removable float which makes it really versatile. You can use it when fishing on a dock, on a boat, or even ice fishing. 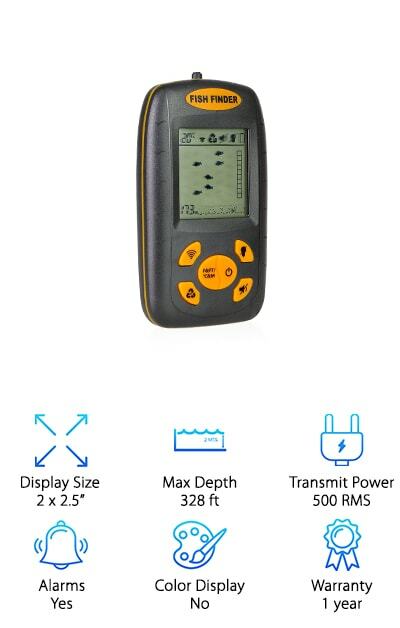 Not only does it detect water depth and temperature, it will also tell you approximate fish locations, where the weeds are, and if there’s any debris or obstacles on the bottom of the lake, river, or sea. You can also choose from a few different modes, including battery saver, fish alarm, and backlight mode. One thing we really liked about this one is that the screen shows fish shapes instead of arches so you know without a doubt that there are fish nearby. 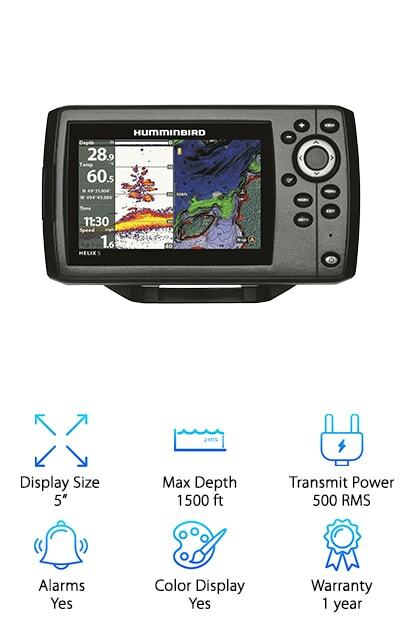 The 2 hummingbird depth finder reviews on our list are for very different machines. While this one is definitely the more basic of the pair, that doesn’t mean it’s not loaded with good stuff. For starters, it has down image and Fish ID+. What does that mean for you? Rather than showing fish on the screen as arches that could blend in with other things, Fish ID+ actually shows them as little fish icons. That makes it much easier to determine what’s a fish and what isn’t when you’re reading the screen. This one has an impressive maximum depth of 320 feet and up to 600 feet when using dual beam technology. The interface is easy to use and the screen is really easy to see, even in bright sunlight. 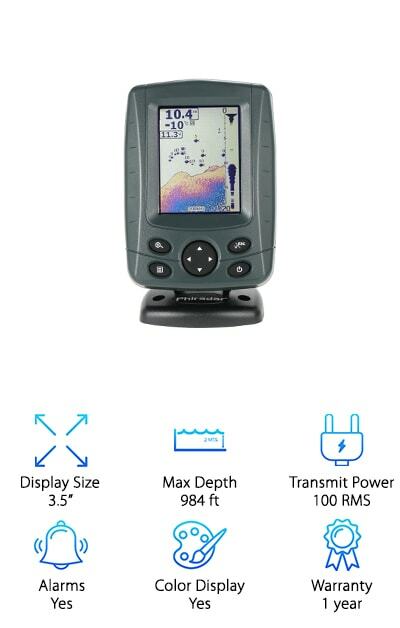 It doesn’t matter if you’re a professional or a weekend angler, this depth and fish finder is for you. The screen is designed so that you can even read it in sunlight so you’ll never miss a thing. It has multi-language settings where you can choose from 15 different languages! Not only does it help you find the location of the fish, it will also help determine depth as well their size. 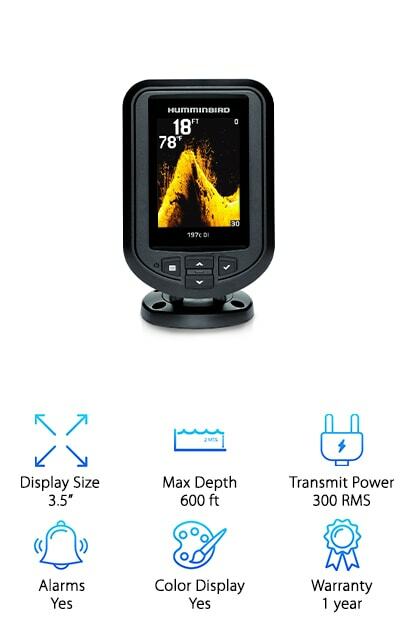 This one is really good at showing you the bottom contour and helping you find schools of fish thanks to the dual beam frequency sonar depth finder. There are audible fish and depth alarms, too, so you never miss anything important. It’s a great companion for any type of fishing, whether in the ocean, lake, or river.